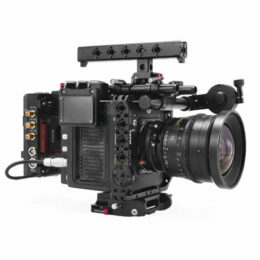 For use with the Tilta RED DSMC2 Cage and the Alexa Mini Cage EVF Holder. Unscrew one end cap for the EVF rod and then slide the EVF Holder with either the RED or Arri Standard Interface on to the rod. Screw back on the end cap to prevent the EVF Holder from sliding off the rail.